U.S. Representative Trent Kelly at Southaven field hearing on the needs of small rural businesses. MISSISSIPPI – On June 18th, the House Small Business Committee held a field hearing in Southaven, Mississippi to examine issues facing rural small businesses including access to capital, lack of reliable broadband, and finding qualified employees. “I thank Subcommittee Chairman Kelly for having me attend this hearing as well and hear first-hand from rural small businesses in North Mississippi. While the economy is doing better thanks to tax cuts and fewer regulations, we can see we still have work to do to help our countries’ small businesses succeed,” said House Small Business Committee Chairman Steve Chabot (R-OH). 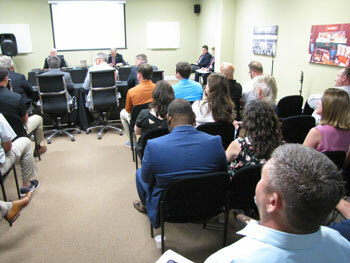 Owners of small businesses in rural MS attend field hearing to discuss their concerns. “Rural Mississippi is lagging behind in the area of connectivity to the internet. I hear stories on a daily basis of school children that have to come to town to download their homework, business growth hampered by a lack of adequate service, and precision agriculture technology that loses a signal due to a lack of connectivity in their area….I commend the Committee for all the work that has been done to bring broadband to rural America,” said Pat Woods, Owner of Woods Farm Supply in Byhalia, MS.
“As we continue to grow, one of our many challenges is when to invest in another full-time employee. As you can imagine being in the service business as we are, people are critical, but due to some of these government initiatives, we have to hold back from hiring and stretch our people further, and as you know there is a breaking point with personnel, and we don’t want to reach that,” said Jason Bailey, President and CEO of Summit Management Services in Oxford, MS.
“The roll back and benefits from the Tax Cuts and Jobs Act created significant financial resources available as expendable income to all of customers, which has been realized by 20% growth from the same period last year,” said Michael Hatcher, President of Michael Hatcher & Associates in Olive Branch, MS.
“The tax cuts afforded to us by H.R. 1, the Tax Cuts and Jobs Act, will make it easier for Hyperion to continue to grow and expand its footprint in both the government and commercial sectors,” said Geoffrey Carter, Founder, President, and CEO of Hyperion Technology Group in Tupelo, MS.